A complete set of maps and town plans make up this indispensable guidebook for spiritual seekers and travelers wishing to walk the way of Saint James. Covering the sacred route from St. Jean Pied de Port to Santiago, this portable book of maps makes the perfect companion for adventurers attempting to heed the spiritual calling. Revised and updated to offer the most recent information, this exploration is light enough to carry while walking long distances each day. The maps show the location of all pilgrim hostels en route, the distances between villages, and points of interest, as well as counter guides, alternative routes, and accommodations. In eight languages: English, Spanish, German, Italian, French, Portuguese, Dutch and Polish. 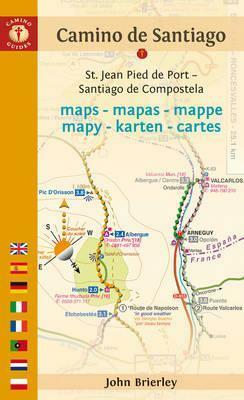 Includes 33 stage maps, 33 contour guides, alternative routes, 14 town plans, accommodation.